A remarkable finale in Croke Park before Limerick won out by a point. AT THE END of a pulsating hurling summer, a long wait for success has ended. Limerick have finally got their hands on the Liam MacCarthy Cup, Declan Hannon the first man from the county to raise the silver since 1973. But that 45-year wait nearly dragged on a bit longer as Galway mounted an incredible late rally in injury-time this afternoon. Shane Dowling’s 68th minute goal looked like it would clinch it yet the reigning champions thundered into contention with Conor Whelan and Joe Canning both rattling the net. The gap was down to one when Niall Burke floated over a 76th minute point before Graeme Mulcahy notched a crucial score for Limerick seconds later. Canning converted a ’65 and then had one chance at landing a levelling point only for his difficult free from distance to drop short. Limerick managed to clear their lines, the final whistle sounded soon after and their hurling fraternity exploded in celebration. Limerick got an injection of confidence in the 16th minute to put them on the right course, Mulcahy pouncing for the opening goal of the game after Kyle Hayes arrowed a pass across. It was a messy score as he scrambled it in and Galway were forced to bemoan their poor defending. Yet for Limerick, the significance of the strike was clear as it arrived moments after Galway had crept in front by 0-6 to 0-5. That provided the platform for Limerick and when their second goal arrived it had the feel of sealing the matter. Gearoid McInerney tried to gather possession in the Galway defence in the 54th minute but he was robbed by Tom Morrissey, who surged through, kept his cool and finished calmly to the net in front of Hill 16 as Limerick’s supporters celebrated joyously. Galway chipped away at Limerick’s advantage but when substitute Peter Casey dispossessed Adrian Tuohey, he raced away before passing to clubmate Dowling who knocked his shot into the corner of the net. That looked like it would seal a comfortable win for John Kiely’s side yet a madcap and dramatic finale ensued before their status as the new kingpins of hurling was confirmed. Limerick were worthy winners. They were ahead 1-10 to 0-9 at the break and with Hayes outstanding early in the second half, they kicked on to go in front 1-15 to 0-10 by the 44th minute. Galway kept battling but the timing of those goals by Morrissey and Dowling proved crucial. The excellent Canning and captain David Burke drove them on in style but Limerick had enough of a cushion to hold with their defence repelling the Galway advances. Scorers for Limerick: Graeme Mulcahy 1-2, Kyle Hayes 0-4, Tom Morrissey 1-1, Shane Dowling 1-0, Aaron Gillane 0-3 (0-2f), Declan Hannon 0-2, Diarmuid Byrnes, Darragh O’Donovan, Cian Lynch, Séamus Flanagan 0-1 each. Scorers for Galway: Joe Canning 1-10 (1-5f, 0-2 ’65), David Burke, Joseph Cooney 0-3 each, Conor Whelan 1-0, Pádraic Mannion, Niall Burke 0-1 each. Email “Champs at last! Limerick end 45-year wait for All-Ireland hurling glory”. Feedback on “Champs at last! 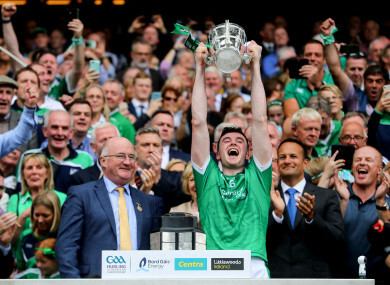 Limerick end 45-year wait for All-Ireland hurling glory”.